I still haven't splurged on another bottle of CND Blackjack, which is my absolute favorite one coat black creme so today I decided to check out my bottle of e.l.f. Black, that I purchased last year off their website during a sale. At only $1 a bottle and with constant sales including a lot of free shipping with orders of x amount (right now it's with orders over $25), this is definitely a much cheaper alternative. But does it work as well? I also have to mention that the bottles are slightly smaller at only 0.35 oz instead of a China Glaze bottle at 0.50 oz. 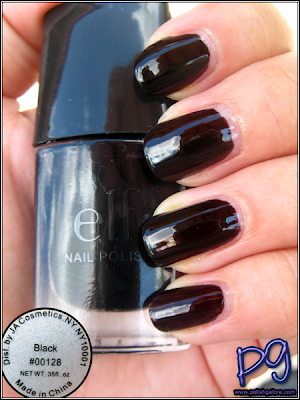 I used a base coat of Seche Natural, ONE COAT of Black and a top of Seche Vite. I do hate that the bottle top is rectangular so it never lines up properly with the bottle. In the sun it looks a little streaky. If I was wearing this as its own color (and not a base for something else) I'd probably use at least 2 coats. In the shade however, the color looks more opaque. As I said, I'm mainly just using this as a base for other colors (sheer ones, glitter or shatters) so it works well for me. Indoors with the flash and again you can see that the pinkie is a little streaky but really, for a dollar? I'm not really complaining. Currently this and many of their other colors are sold out, but they might be restocking soon? 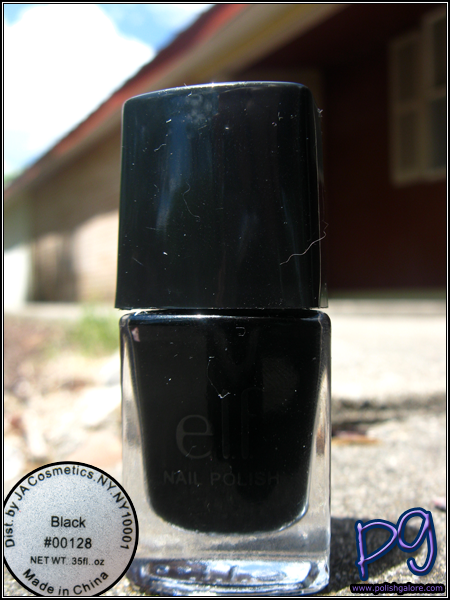 You can purchase e.l.f. on their website. You can like them on Facebook, follow them on Twitter, be their friend on MySpace and subscribe to their YouTube videos. 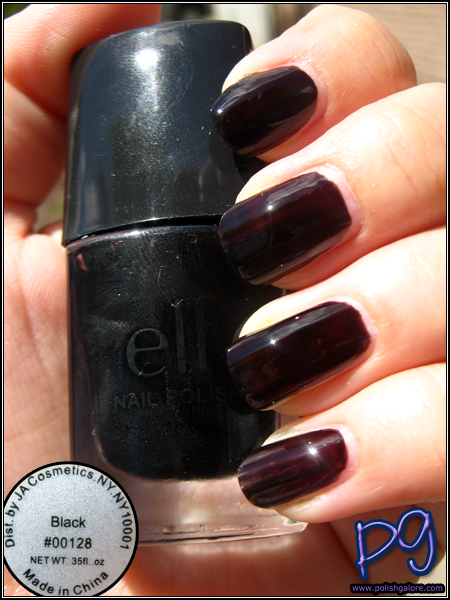 I am in love with E.L.F. products. True they aren't the tip top of the line but as you stated, for the price, you really get a bang for your buck.